Front Row:Kevan Hamilton, Jack Sullivan, Ron O'Dwyer, William "Bill" Hoogen, Jim Lalor. K. Robinson (Melbourne) 23 yo, 5ft.11ins, 12st 7lb. Doug Campbell (Dandenong) 22yo, 6ft.31/2ins, 13st 7lb. Kevin Clarke (Western Australia),(Melbourne) 25yo, 6ft 4ins, 13st. Vic Garra (Thirds) 20yo, 6ft., 13st. Ron O'Dwyer (Broken Hill) 18yo, 5ft 7ins, 11st. 7lb. Ross Ousley (Golden Square) 21 yo, 6ft., 12st. 7lb. Kevin O'Brien, G. Dawson, J. Nilsson, John Buckley. Played 2, Won 1, Lost 1, For 143, Against 183, 78.1%, Points 4. Round 3 - 28th April, 1956. Goals; Max Ellis 5, Graham Gilchrist 2, Jack Mills 2, Jack James 2, Ross Ousley 2, Aitken 2, Kevin Bergin, Doug Campbell 1. Best; Graham Gilchrist, Jack Sullivan, Jack Mills, Leon Berner, Barry Archbold, Max Ellis. Played 3, Won 1, Lost 2, For 255, Against 311, 81.99% Points 4. Goals; Bob Crowe 2, Aitken 2, Kevin Bergin 2, John Benetti 2, Jim Baxter 2, Brian Buckley, Maurie Pope, Bob Bosustow 1. Best; Bob Bosustow, Frank Munro, Robert Licciardo, John Benetti, Doug Campbell, Bob Crowe. Played 4, Won 1, Lost 3, For 343, Against 410, 83.6%, Points 4. Goals; Jim Baxter, John Benetti, Aitken, Lalor, Crawford 1. Best; Frank Munro, Robert Licciardo, Colin Holt, Ross Ousley, Max Ellis, Barry Archbold. Played 5, Won 1, Lost 4, For 381, Against 475, 80.2%, Points 4. Played 6, Won 1, Lost 5, For 416, Against 563, 73.9%, Points 4. Played 7, Won 2, Lost 5, For 501, Against 641, 78.2%, Points 8. Played 8, Won 2, Lost 6, For 551, Against 723, 76.2%, Points 8. Goals; Ron O'Dwyer 3, Bob Bosustow 2, William "Bill" Hoogen, Doug Campbell, Jim Baxter, Kevin Bergin, Morrisey 1. Best; Brian Buckley, Dawson, Leon Berner, John Benetti, Max Ellis, Maurie Pope. Played 9, Won 2, Lost 7, For 619, Against 817, 75.76%, Points 8. 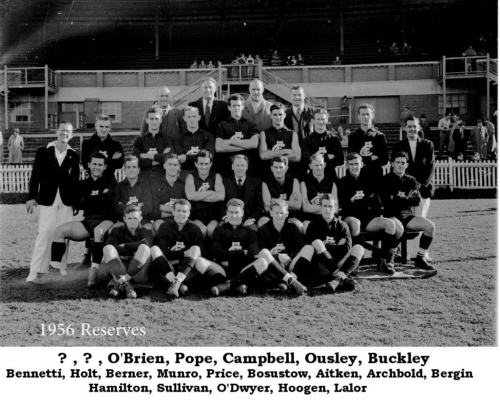 Goals; Ron O'Dwyer 2, Kevin Bergin 2, Ross Ousley 2, John Benetti, Jim Baxter, Maurie Pope, Aitken, Kevan Hamilton, Doug Campbell 1. Best; Jack Sullivan, Colin Holt, Bob Bosustow, John Benetti, Kevin O'Brien, Kevan Hamilton. Played 10, Won 2, Lost 8, For 702, Against 914, 76.8%, Points 8. Split round Carlton did not play. Played 11 Won 2, Lost 9, For 751 Against 992, 75.7%, Points 8. Goals; G. Dawson 4, Kevin Bergin 2, Leon Berner, Aitken, Jim Baxter, Ian Findlay, Kevin O'Brien 1. Best; Leon Berner, Brian Buckley, Kevin Bergin, G. Dawson, William "Bill" Hoogen, Kevin O'Brien. Played 12, Won 3, Lost 9, For 831, Against 1059, 78.47%, Points 12. Played 13, Won 3, Lost 10, For 894, Against 1167, 76.6%, Points 12. From, Aitken, Bill Armstrong, Brian Buckley, Kevin Bergin, Jim Baxter, Barry Beitzel, Leon Berner, Crawford, G. Dawson, Jack Ellis, Max Ellis, Ian Findlay, Gardner, William "Bill" Hoogen, Robert Licciardo, Lalor, Max Miers, McRae, Kevin O'Brien, Ron O'Dwyer, Maurie Pope, Laurie Rogers, Pertile. Played 14, Won 3, Lost 11, For 954, Against 1237, 77.1%, Points 12. Goals; Max Ellis 4, Kevan Hamilton, Ron O'Dwyer, Kevin O'Brien 1. Best; Brian Buckley, Robert Licciardo, Maurie Pope, McRae, Laurie Rogers, Max Ellis. Played 15, Won 4, Lost 11, For 1012, Against 1294, 78.2%, Points 16. Played 16, Won 4, Lost 12, For 1087, Against 1389, 78.3%, Points 16. Goals; G. Dawson 2, Max Ellis 2, Kevin O'Brien, Kevin Bergin, Gardiner. Best; Laurie Rogers, Kevin Bergin, John Benetti, Aitken, Max Miers, Max Ellis. Played 17, Won 4, Lost 13, For 1138, Against 1478, 77.0%, Points 16. Final game for the season. Reported; Bob Bosustow reported by Goal Umpire Price for striking R. Dixon (Footscray). Played 18, Won 5, Lost 13, For 1213, Against 1536, 79.0%, Points 20. Contributors to this page: Bombasheldon , blueycarlton , Jarusa , pblue , tmd1 and molsey . Page last modified on Thursday 25 of August, 2016 22:09:26 AEST by Bombasheldon. 2000 Semi Final - Match Summary Vs Brisbane. 1984 1st Semi - Maclure marks in front of Greg Phillips.